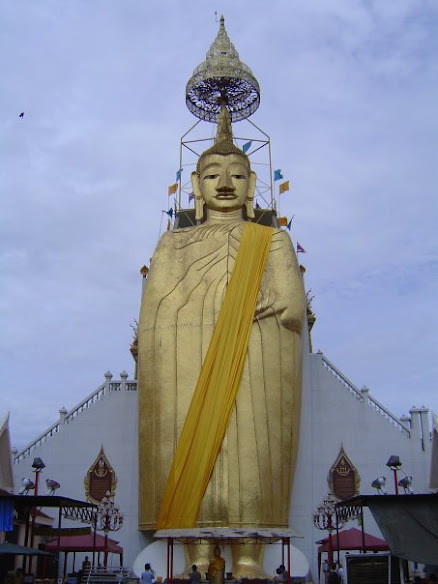 This is the Standing Buddha all the tuk-tuk drivers want to take you to. You want to travel alone!? 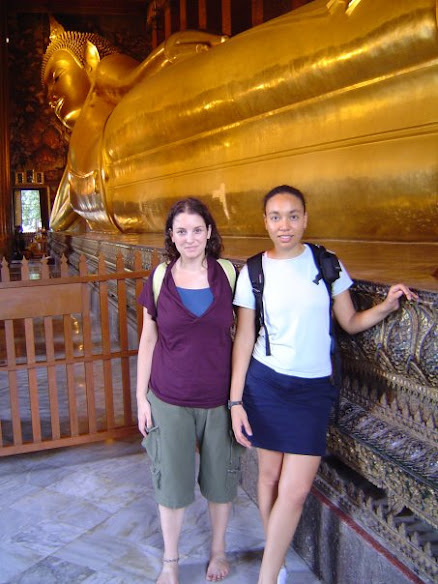 On my first trip to Thailand, I went with my friend Melodie. We were working at the same company in Seoul until she decided to go back home to continue her education. Before heading back to Canada, she wanted to travel a bit first. I joined her for the Thailand leg of her trip. She then went alone to northern Thailand and then to India. I was so impressed that she would, as a female, travel by herself and think nothing of it. The next year, while still working for the same company, when my vacation time came around, I went to China alone. If Melodie could do it, and enjoy it, then I could too. There are many benefits to traveling alone. You can use the time to “be one” with your thoughts and do what YOU want to do when you want to do it. You can also meet tons of new people to travel with for a few days, part ways, and then meet other new people to travel with; if you want. I enjoy traveling with friends and family, but there is something to traveling alone. One isn’t better than the other. They both have benefits and draw-backs. I always make sure, when traveling alone or with friends, to regularly e-mail friends and family back home so that if something does happened to me, there would be someone who notices a change in the communication pattern. But Melodie’s inspiration didn’t just get me started on solo travelling. She was the one who encouraged me to start blogging about my travels. I think that what she was really doing was getting more friends on her travel blog network, but whatever. This is the end result. When I got home from this trip I put a few pictures up on the site and forgot about it until she did her entry on her trip through India. That’s when I wanted to blog about every trip I had ever taken. I found myself planning trips just so that I could have something to write about. Eventually, I would outgrown the travel blog site I was using. I looked for a blogging format that better matched my needs. I found WordPress and started the blog you are now reading. And it all started with Melodie. We came to see some ladyboys! 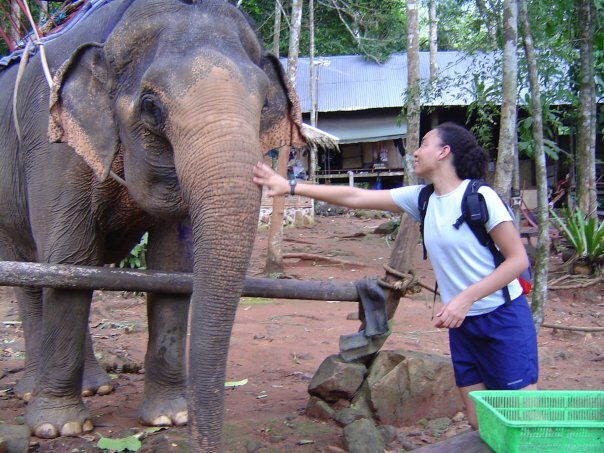 All I really wanted to do in Thailand was to see a ladyboy show and ride an elephant. I felt that our chances of seeing a ladyboy show would go down to zero once we left Bangkok, so we had to get that done there. Our first night in Bangkok we walked around asking people who looked helpful, “Where can we go to see a ladyboy show?” We got strange looks and I was beginning to wonder if they thought we were looking for prostitutes. The show was amazing. Even in our cheap seats the show was unforgettable. The songs, the dancing, the entertainers playing with the audience all made for a grand evening. I highly recommend it! The next day, our first full day in Thailand, we went out to see the sights. We got pulled into one tuk-tuk scam after another. Lucky for us, we didn’t have any money and all they did was waste our time, which we had plenty of. One of the scams started when a tuk-tuk driver’s friend convinced us that the Grand Palace was closed, but it would be opened later. 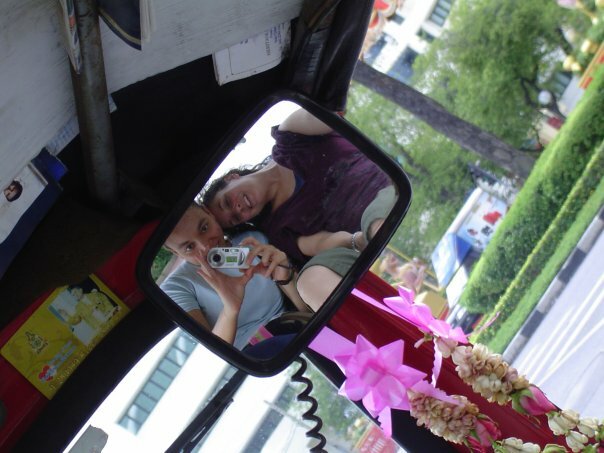 In the mean time we could take a cheap tuk-tuk tour of Bangkok. He happened to have a cousin or friend who drove a tuk-tuk. 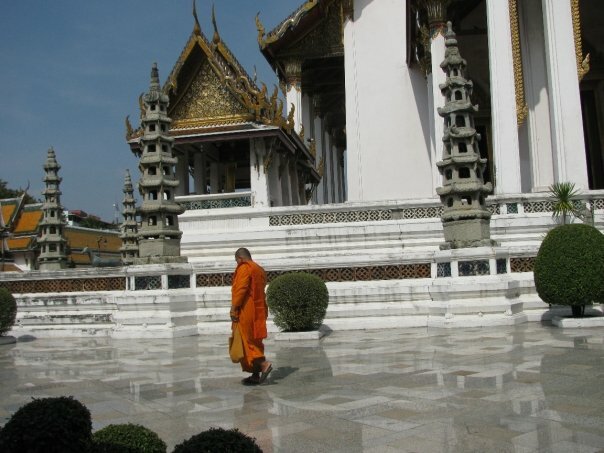 This tour came with free admission to several temples that most tourists don’t know about. (No one knows about them because they are not tourist attractions, just regular functioning temples and they are always free.) There was just one catch… The driver had to take us to tailor shops and jewelry stores where we had to look around for about 10 minutes. We didn’t have to buy anything, but we did have to go in and look interested. It was presented to us like this tuk-tuk driver was actually scamming the shop owners who pay them in gasoline to bring in tourists. He gets enough gas to run his tuk-tuk for the day and we got nothing but benefit. I kind of felt we were helping this guy out, though the whole set-up made no sense to me financially. The guy took us to several places, first a shop then a temple then another shop and so on. When it was time to go into a shop we did the mandatory 10-minute look around, sometimes with awkward conversations, then we would leave. At first everything was okay. But, after a few stops the driver got a little angry. “You’re not going to buy anything! ?” He started talking to us with an annoyed tone. We might have, only he took us the tailor shops that made suits and jewelry stores that sold diamonds and rubies.We couldn’t afford any of those! Besides, what am I going to do with a suit? Shove it in my backpack with my flip-flops and snorkel? 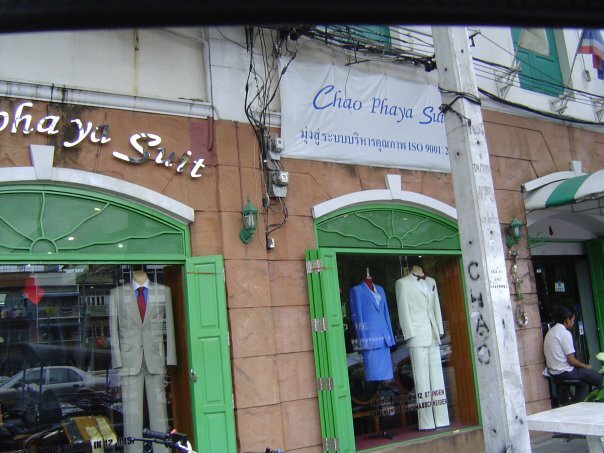 If they took us to a trinket or sarong shop we could have easily drop $20-30 on clothes and stuff. But, there was just no way we would buy a $500 diamond ring or a $200 suit. We were backpackers! Other scams were less time-consuming. 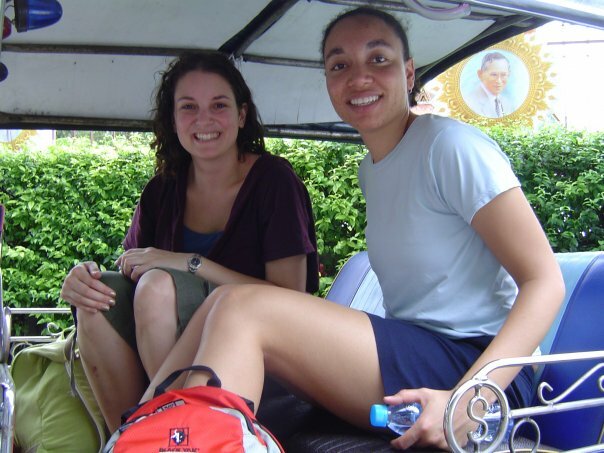 They were mostly about overcharging us for short tuk-tuk rides. These weren’t so bad, since even with a price hike the rides were still inexpensive. The only thing I really felt cheated out of was air conditioning. It was very hot and tuk-tuks have no fans or other type of cooling. We were out in the elements and breathing the air of downtown Bangkok. After just one day of this, we had had it with Bangkok. 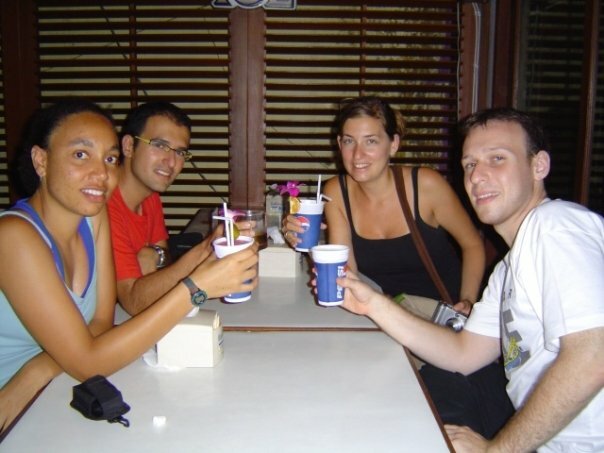 That night, we took a late bus to the countryside to the town of Trat. 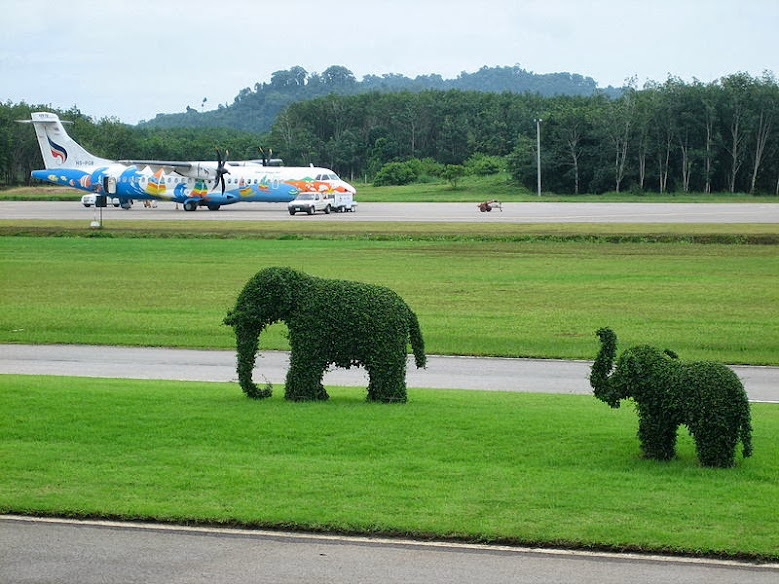 Now bring on the Elephants! 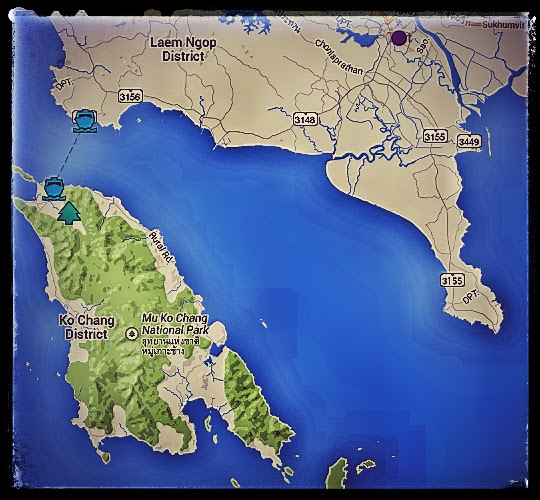 From Trat we took a boat to Koh Chang and ending up on one of the many backpacking beach side places with a hippy sounding name. It was cheap. The food was delicious and cheap. There were many interesting people to talk to. It was great. I would wake up early in the morning, have breakfast, swim a little, then walk around to the other resorts meeting other people and finding interesting things to do. Someone would recommend renting a scooter, for example. Then someone else would point out some backpacker limping around on crutches as, “what happens when you rent a scooter.” There were many tales of “Holiday Horrors” presented in the form of “I met a guy who met a guy who rented a scooter”. Melodie got a new tattoo on Koh Chang which was done with the bamboo and hammer method. I thought about getting a small tattoo somewhere where it wouldn’t hurt, but such a place on the body just does not exist. I am still tattoo free and I’m okay with that. We rode an elephant, fed him, and washed him too! While on our elephant ride through the jungle, Melodie’s bag fell off the seat and onto the path behind us. Without any prompting from anyone, the elephant stopped, turned his head, and picked up the bag with his trunk and handed it randomly to anyone on his back. We were impressed! This looks like a nice place for lunch. 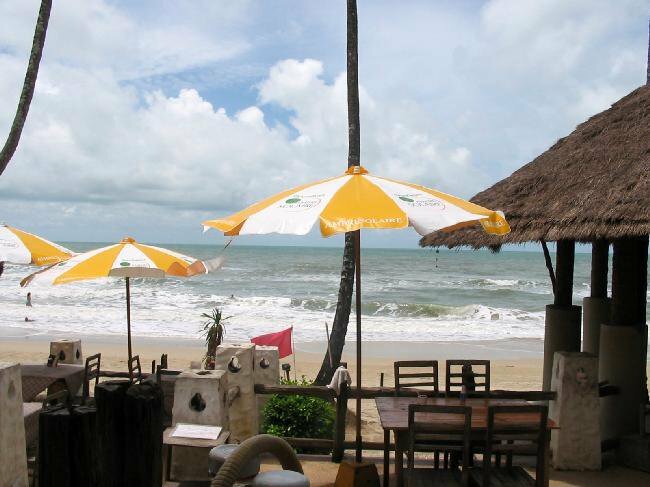 The sea was a bit rough since monsoon season was just ending. I couldn’t swim as much as I would have liked. The sea was at its calmest in the early morning so that is when I went swimming. In the early afternoon when the day was very hot, I would find a shady spot in a hammock to relax and read. On one of those hot afternoons everything made sense. This was when I had a flash of clarity. I knew exactly what I wanted out of life. I wanted to do this many times over and in many other countries. I wanted to travel and see the world. Right now, Mark and I are just about sick of Bangkok. We’re going to do some serious job hunting in the next few days and head down south on Friday. I’m not sure where we’ll end up. 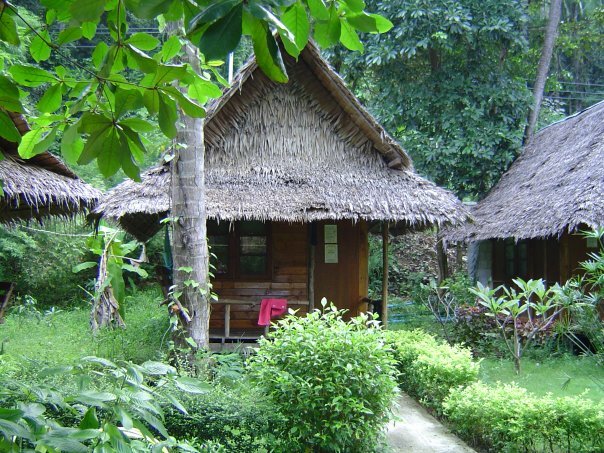 Maybe Krabi and on the Phi Phi Islands. Any tuk-tuk or cab driver worth his salt should know where Calypso is. It’s near the Ratchathewi BTS in the Asia Hotel. 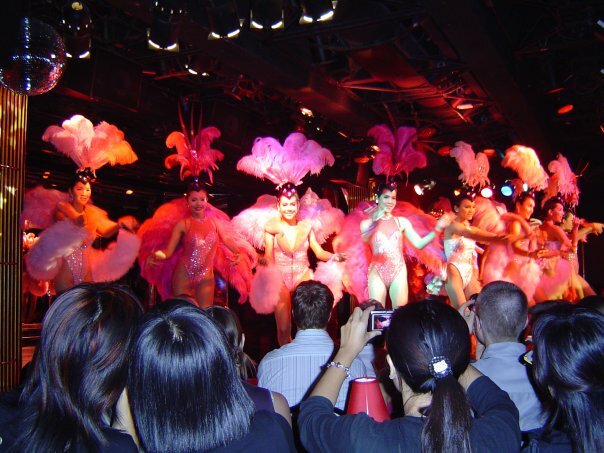 This is where most tourists go to see a ladyboy show. Go to Eastern Bus Terminal, also known as Ekamai Bus Terminal. You can find it near the Ekamai BST station (E7). Go out exit 2 of the BST station and make a u-turn. You’ll see the bus station once you pass the 7-11. Buses leave for Trat every hour. You can also fly there. It’s called “elephant island” not because it has elephants, though it does have many, but because the island is supposedly shaped like an elephant. You can usually ask at the reception desk of your hotel or hostel for help with transportation. They can call a taxi for you. 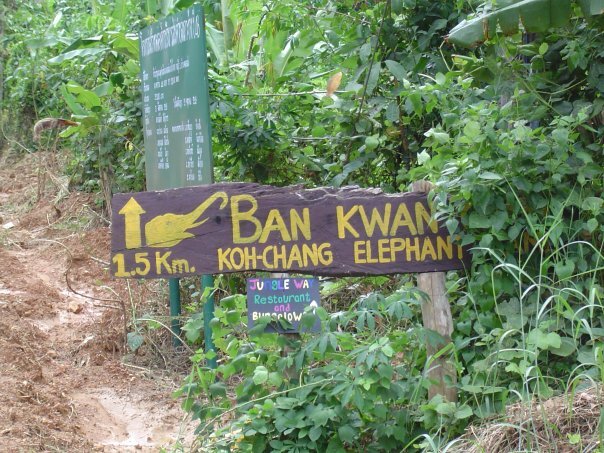 This is one of the places on Koh Chang where you can ride an elephant. You can also fed, wash, and swim with elephants. When I went there the cost of the ride came with a plate of fruit for you to eat, a bunch of fruit for you to give the elephants, and a bottle of coke (for you, not the elephant).